Pictures shown are the front and back covers of the actual book for sale.By Ron Goulart - By Les Daniels - Little, Brown and Co. (1995) - Hardback - 256 pages - ISBN 0821220764 In 1935, popular culture was transformed forever when DC published its first book of "all-new, all-original comic material. To the delight of millions of kids everywhere, the modern comic book was born. With the introduction of Superman in 1938. DC Comics made history again, this time with the publication of the first super hero comic book. To this day, the Man of Steel remains the most recognized and celebrated hero in the world. Inspired by its innovative early success, DC went on to create legions of other superheores -- Batman, Wonder Woman, the Flash, Green Lantern, and dozens more of the most popular comic book characters ever created. In the sixty years since the first super heroes wer ecreated, the artists, writers, and editors of DC Comics have been developing, refining and extending the reach of their comic book characters. 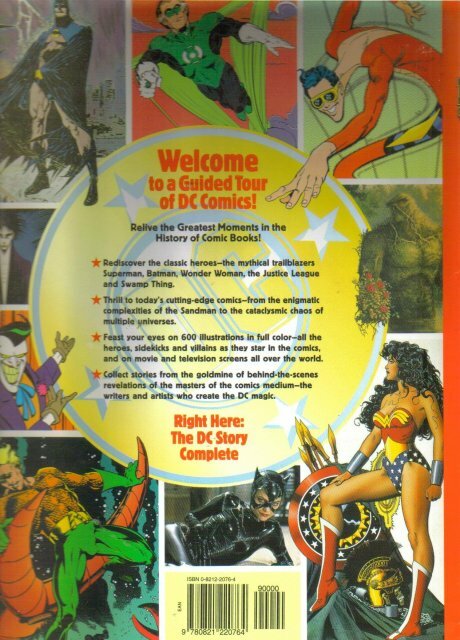 The DC fictional world has branched into a worldwide profusion of entertainment formats: books, toys, movies, radio, television, videogames, and an online computer network. Here, for the very first time, is the complete story of America's favorite heroes and their talented, dedicated creators. In over 100 short and spirited essays, author Les Daniels offers remarkable new anecdotes about the company's history, traces the complex genealogies of the characters, describes behind-the-scenes politics that influence the stories, and interviews dozens of artists and writers -- the real stars of his engrossing tales. The reader can open the book anywhere and become immersed immediately in the fantasy world of high adventure and magical mayhem. Items Similar To "DC Comics Sixty Years of the World's Favorite Comic Book Heroes h..."